First things first, a draw for the States is a favorable result. With a weak remaining group schedule, avoiding a loss to England will go a long way towards advancing from our bracket. Secondly, I can’t help but feel bad for English keeper Robert Green. It was nothing more than a bad bounce, and he will go down in history as the goalie who blew it against America. He could have gotten in better position to make the save, but I’m not holding it against him. I’ve scored on my own net before, and it’s the absolute worst feeling in the world. But on this stage? That will haunt him forever. Personally, I would have stared David James in goal, but I’ll give England coach Fabio Capello the benefit of the doubt. After all, he is with the team everyday, and my knowledge is based on the fact that James is awesome in my video game. Opposite of Green, U.S. goalie Tim Howard played spectacularly in net. The goal in the 4th minute was iffy, but after that he looked phenomenal and kept the Americans in the game. Howard also showed his toughness, playing through an injury in the first half that looked pretty painful. England had several open looks late in the game, but every time Howard was equal to the task. I would like to see the American’s tighten up that defense, though. The Brits often had men open in the box and failed to convert on several open looks. They did a good job at containing Wayne Rooney in the first half, although he had some chances late. 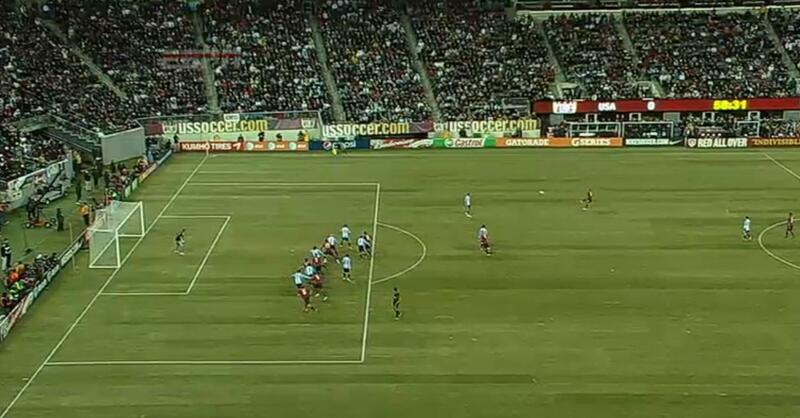 The only other thing I have to add is that I want to see American defenders find their marks sooner on second and third chances–there were a few times England had a man unmarked but they failed to find him. Steve Cherundolo and Jay DeMerit had their names called on the broadcast more than anyone, and after they shook of the initial jitters they played good soccer. Check back throughout the week for more World Cup coverage. The other teams in group C are Slovenia and Algeria, who play each other tomorrow at 7:30 a.m. EST. The United States play their second match next Friday, June 18 at 10 a.m. EST versus Slovenia.